"If you knew of a care provider with 25% occupancy shortfall for 6 months, which of the remedial activities below would you recommend over the subsequent 6 months?" This is a question that came up on a LinkedIn forum recently. There wasn't room to give a comprehensive answer there so I though I'd expand on it here. Fixing occupancy problems in any home is a process that starts with identifying the cause of the problem. In my experience of helping over 650 homes with their marketing over the last 9 years this comes down to the following fundamental things. 1. Bad CQC report. Fix this first and put all your time energy and resources into doing it. Rated 'requires improvement' or worse less is a massive red flag. It's like having a cross on the door during The Plague - To enter you'd have to be blind, crazy or have someone you loved dearly inside.Same with care homes. No healthcare professional whose reputation and job is on the line is going to choose a home with 'requires improvement' or worse if they have any other choice. Same with families. 2. Poor strategic marketing. This is what you say, how you say it and who you say it to. There needs to be a local market for the level of service you're providing, you need to have the type of home that satisfies that demand and you need to give people compelling reasons why they should choose you over your competitors. Apart from not actually doing any marketing, this is the biggest problem care homes face. All their marketing looks the same and says the same thing. 3. No lead generation. They can't choose you if they don't know you exist. This is the easiest problem to fix. 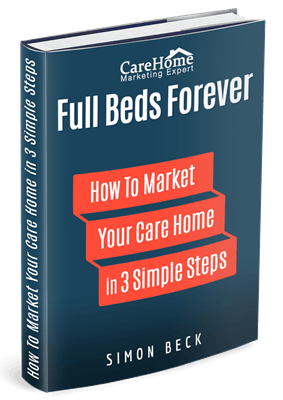 In my new book on how to market your care home I give 42 different ways of getting the phone to ring and people to walk in the door as well as laying out my complete blueprint for marketing any care home that covers everything touched on here. The book is being published on 16th October and I'm giving away 50 copies for free in the first week to celebrate. If you want a copy you can get on the launch notification list at www.carehomemarketingbook.com. 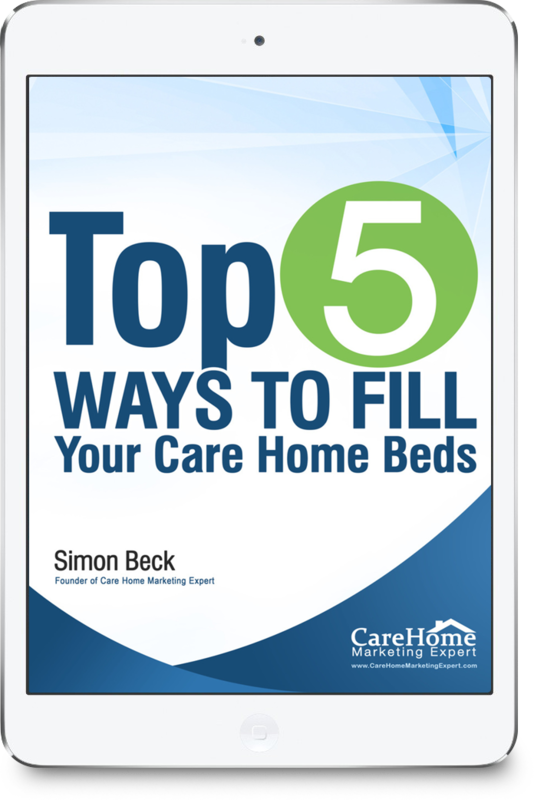 In it I reveal our complete blueprint for marketing your care home including 42 methods for generating new enquiries and how your staff are killing your business (without you or them knowing it). 1. Poor infrastructure and atmosphere. I once went to do a mystery shopper exercise at a home in Manchester and outside the front door was a plant pot with a dying plant and stubbed out cigarette butts in it. If it had been for my relative I'd have turned round and walked away there and then. Trouble is when you see your home every day you don't notice its imperfections, so get some fresh eyes on it. Then fix all the problems they see. 2. Poor staff training & lack of systems. We routinely ask care staff with no sales training to be responsible for showing someone around the home. That's crazy. The success of your business rests on keeping full occupancy. The funds for everything else come from that. 80% of you profit comes from the last 20% of filled beds. If your staff make a mess of things and put someone off, that's everything lost. All the hard work and effort you invested to get people to this point is for nothing. All for the want of some decent training. The moment a room becomes vacant a well oiled machine should move into place to ensure the room is dressed to perfection and any and all staff members who may be required to do a show around are properly trained and know exactly what they should do and how they should do it. The person visiting must have a comprehensive information pack to take away with them that reminds them of all the reason for choosing your home and you must follow up the visit systematically and in a way that completely 'wows' them.